Cleaning all types of offices and commercial facilities in Charlotte and surrounding areas. Jantize is employee owned. That means we’re just around the corner when you need us and, as a part of our community, we care about your business. Has been cleaning our office for several years, affordable, and if there is a problem they correct it immediately. Todd Horsfall the Area Developer for Jantize Charlotte joined Jantize in 2013 and has enjoyed helping business owners fulfill a dream of owning a business and building a future for themselves and their families. 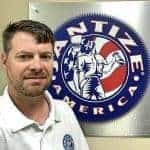 Todd came from a strong sales background which has helped building Jantize to now servicing over 150 facilities in the Charlotte Metro area ranging from smaller offices to over 150,000 sq ft facilities. When Todd's not working the business he can be found on a baseball field or dance recital watching his children perform.